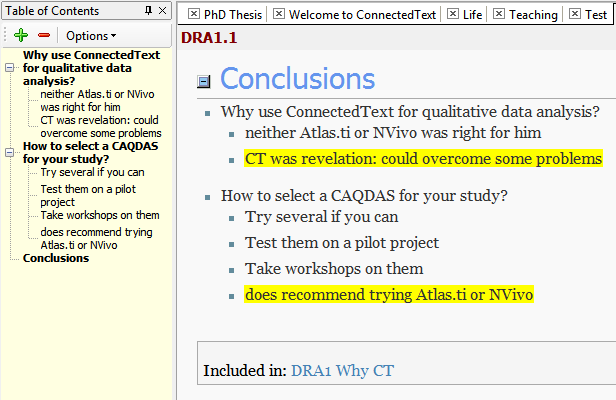 A new version of ConnectedText (the personal or desktop wiki that I use as my main notes database and qualitative data analysis tool) was released last week. The complete list of new features, improvements and other changes is here. I have been using the beta version for some months now but I still haven’t had time to try everything out yet. Nevertheless, here is a list of the new features that I find the most significant from my perspective as an academic researcher and writer. 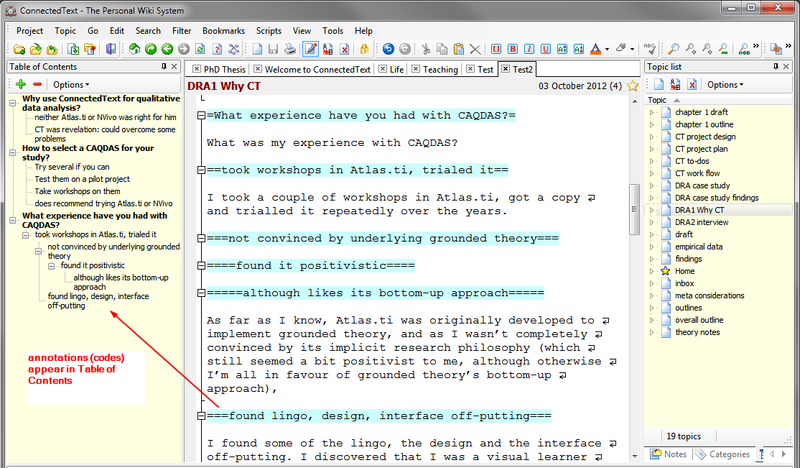 Floating windows – now it’s possible to see multiple topics (CT’s word for “document”) in freely positionable windows, while editing another topic. You can also preview the topic you are editing, if you wish. 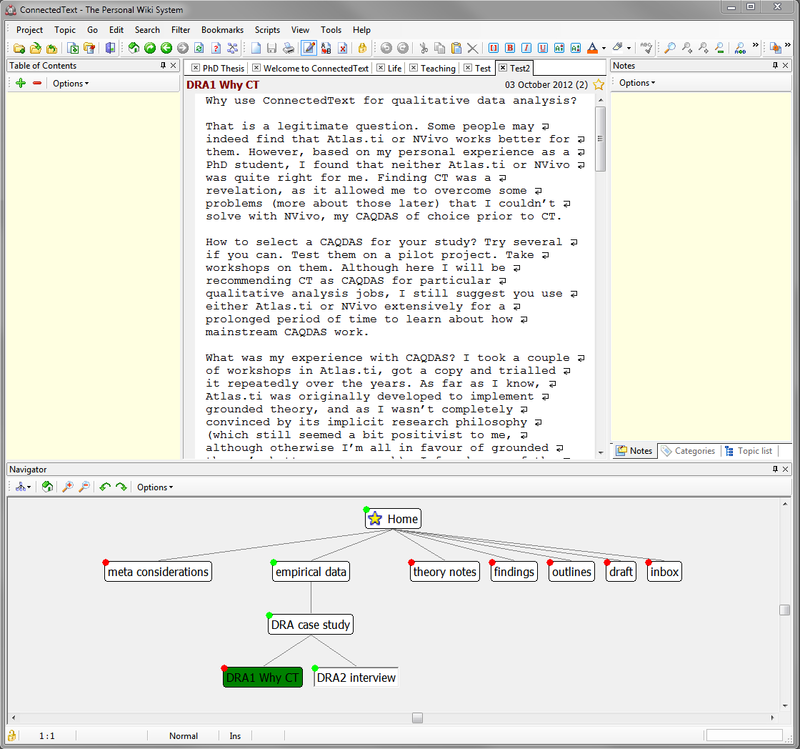 Named blocks – effectively a qualitative data analysis feature to mark up passages and gather them in another topic. It expands CT’s abilities as a CAQDAS alternative, although to run it on big projects one would need a powerful computer (but isn’t that the case with most CAQDAS?). I’m still trying to figure out how to make the most of this new feature, but I’m excited about the possibilities. Table of Contents pane – acquired some outlining capabilities, as it now works as a two-pane outliner in conjunction with the edit window. 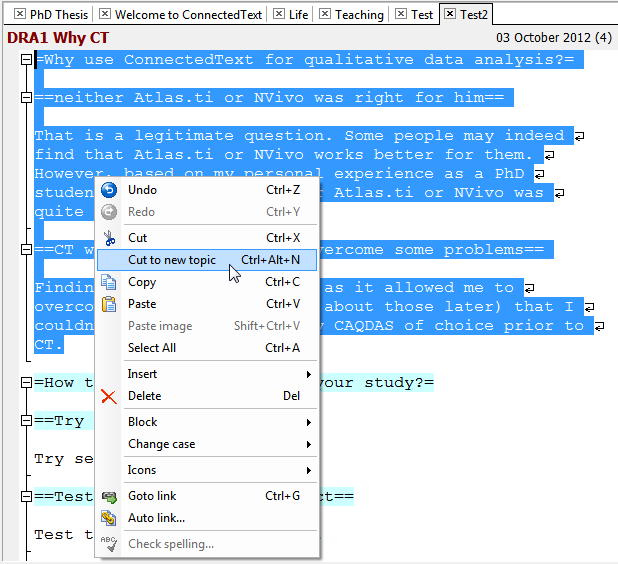 One is able to edit headings in the TOC pane and use keyboard shortcuts to move them around, and their associated text will also move with them in the editor pane. Outliner pane – one is now able to drop files and folders onto the tree, and save outlines as templates to be used in the edit window. Ctrl+C and Crtl+V shortcuts are now working within the Outliner. Ability to disable inclusions (transclusions) for a project (a CT database), which enable faster navigation of complex projects with long daisy-chains of inclusions that require a lot of processing time. 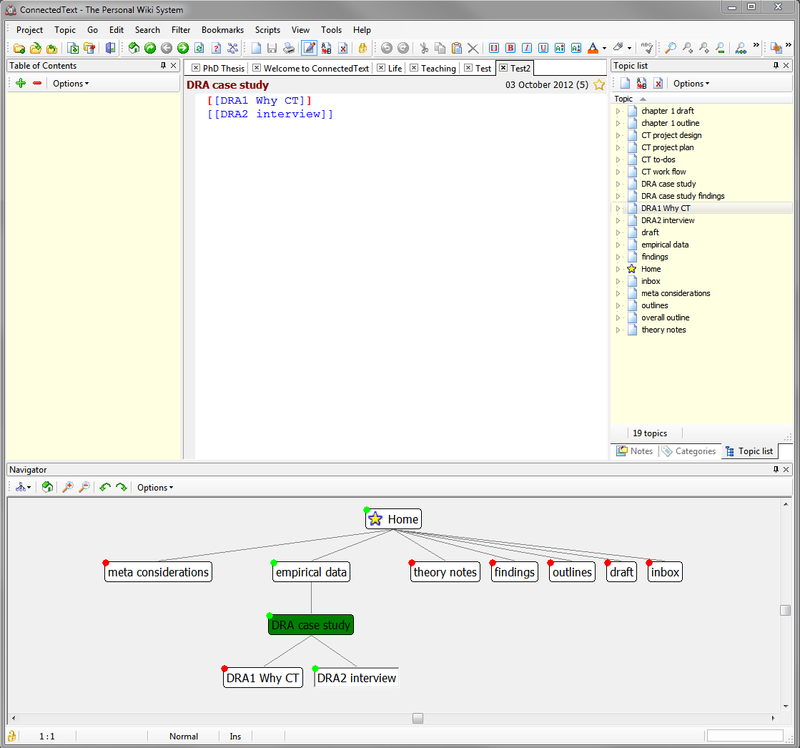 Navigator – ability to remove nodes (topics) from the Navigator view allows for purposeful analysis of the network relationships between linked topics (by eliminating unimportant links from the picture, to reduce ‘noise’). I also like the new “Back” button, which allows you to backtrack in the network tree if you had wandered too far down into a branch. 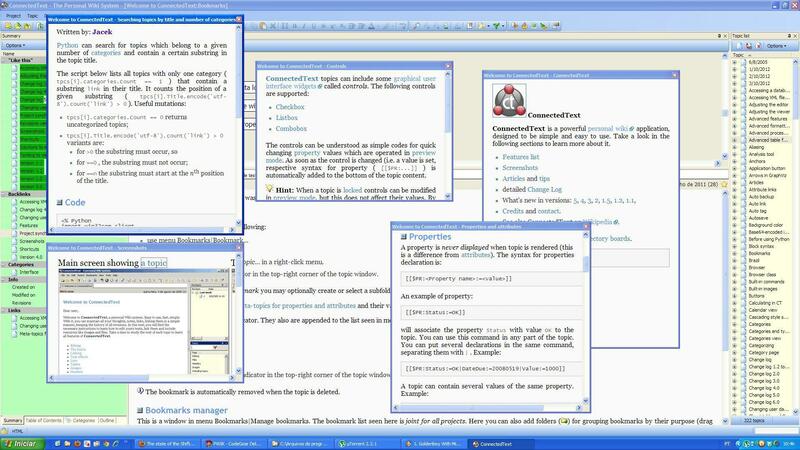 Auto-numbering (legal numbering) of headings in the editor. Conversion of imported OPML outline headings into hierarchical bullet-point outline in the editor. Here is Manfred Kuehn’s selection of his favourite new features in CT v. 6. 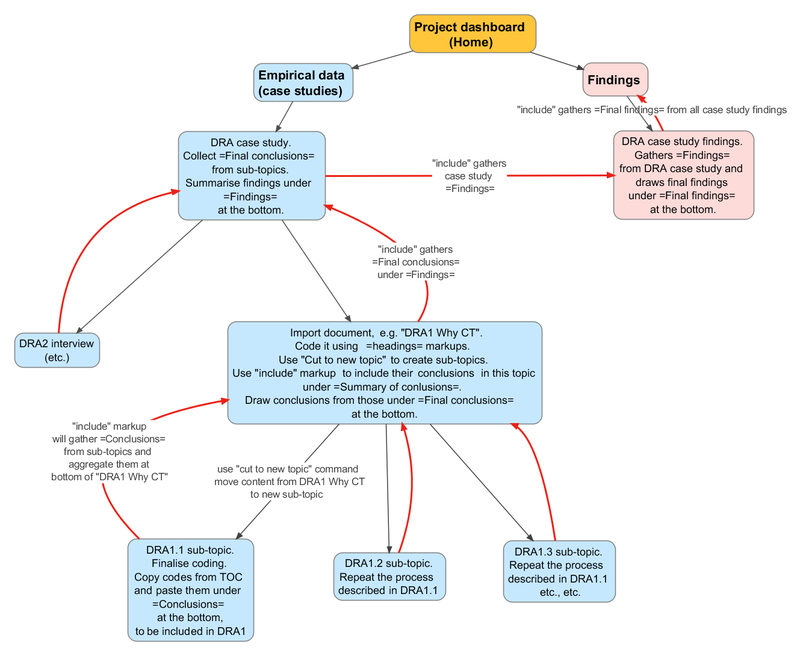 If you’re wondering, I’m towards the end of the qualitative data analysis process that I’ve been describing in my ConnectedText (CT) tutorials (and in particular in this chart on the right). More specifically, I’m working on my “Findings” topic (a ‘topic’ is a document in CT’s lingo), and just today I have finally managed to complete the analysis and evaluation of all the underlying topic levels. 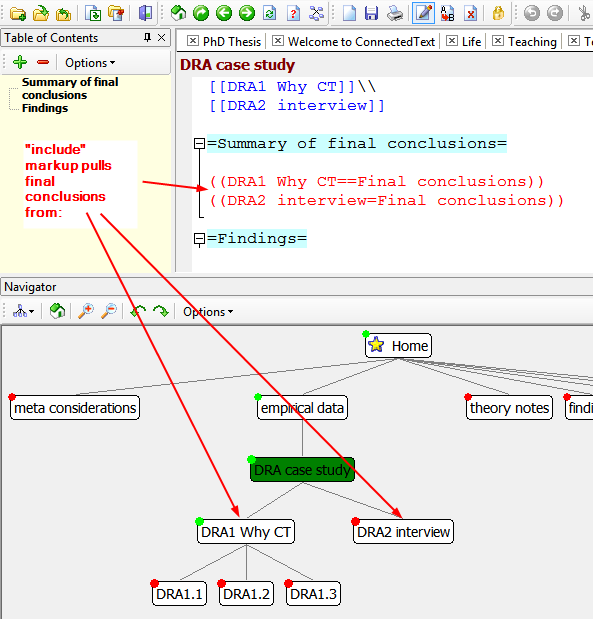 This means that the “Findings” topic has now collected (by way of CT’s magical “include” markup) all the =Final findings= sections of its child-topics, gathering all the findings of my empirical research on one page. This is obviously an important moment for my research project, as this will be the first time that I will be able to survey all the disparate conclusions I have drawn from nine case studies. The primary data that I have imported into CT amounts to around 800,000 words. The secondary material that I have externally linked to and which I have also reviewed could probably double that figure. This material and its associated analysis are contained in exactly 560 topics in my CT database as of today. My “Findings” topic is pulling the analysis from all these topics together into a single topic. 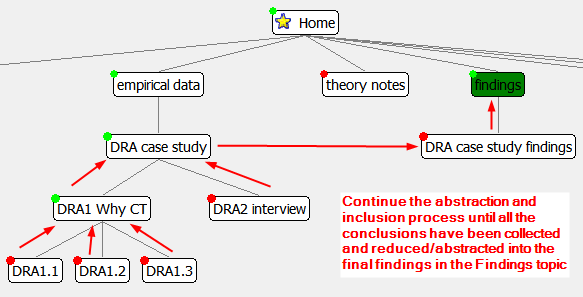 Under the =Summary of final findings= I have now a structured list of conclusions, with several levels of headings. The text of the “included” findings amounts to 2,834 words. This is the output of what I half-jokingly referred to as my “idea-sausage machine,” which had allowed me to process and reduce 1 million+ words into 2,834 words. In a sense this model was really a kind of machine, as part of the process involved mechanical extraction of text from one document and incorporating it into another document, over and over again. However the other half of the machine was my brain, where the “theory filters” had been applied to the data and where abstraction was carried out. Nevertheless, both processes depended on each other: the mechanical extraction was part of the mental process of abstraction, but so was abstraction part of extraction. Tool and thought were very much co-dependent and they needed each other to produce the result: 2,834 words, which hopefully are transporting some interesting messages that can help answer my original research question. So what next? Tomorrow I will need to reduce these 2,834 words further, possibly to a single (thesis) sentence of 15 or so words, which will be the short answer to my research question, and then to a 150-word abstract and also some more verbose formulations of my findings. How will I do that? 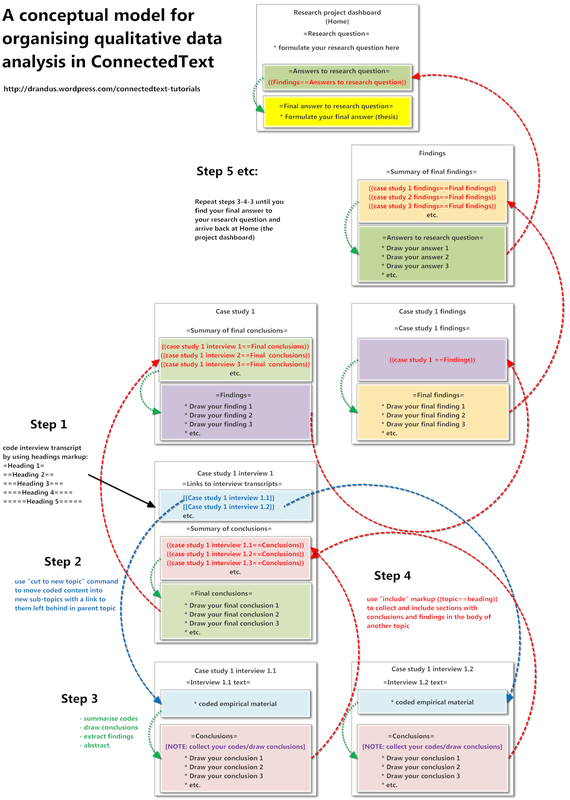 Well, as my attached chart shows, I have been through the hoops and loops of “abstraction by way of extraction” a few times, as I gradually climbed my way up the daisy chain of my CT model. 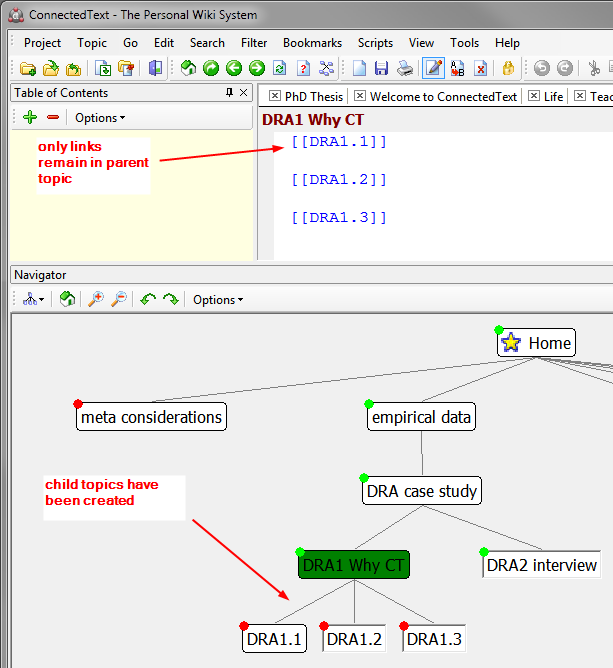 Basically, I will need to use some tools in association with some brain cells once more.They key process involves classifying the remaining text on the basis of the themes and arguments it contains, and organising these into a hierarchy, where the more general points (conclusions) rise to the top of the hierarchy, while the specific points (examples, supporting evidence, details) are relegated to lower levels of the hierarchy, and superfluous points are relegated to the bottom of the list or deleted altogether. This task calls for some kind of an outliner software. Now, CT is fairly well equipped to provide you with tools to guide you through this entire process. 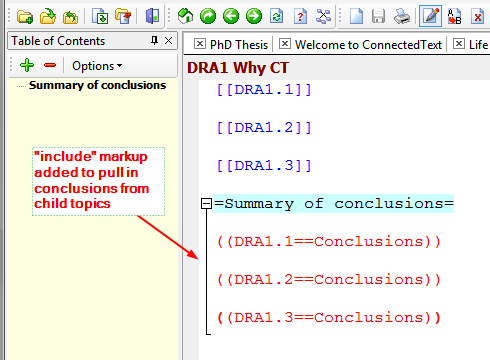 If the text to be analysed is simple enough, you could do the above analysis in the body of a CT topic itself, or in CT’s Notes pane, or in its dedicated Outliner tool, which can be docked or undocked. Indeed, I have constructed some enormous outlines with CT’s outliner, e.g. one with over 1,200 items. 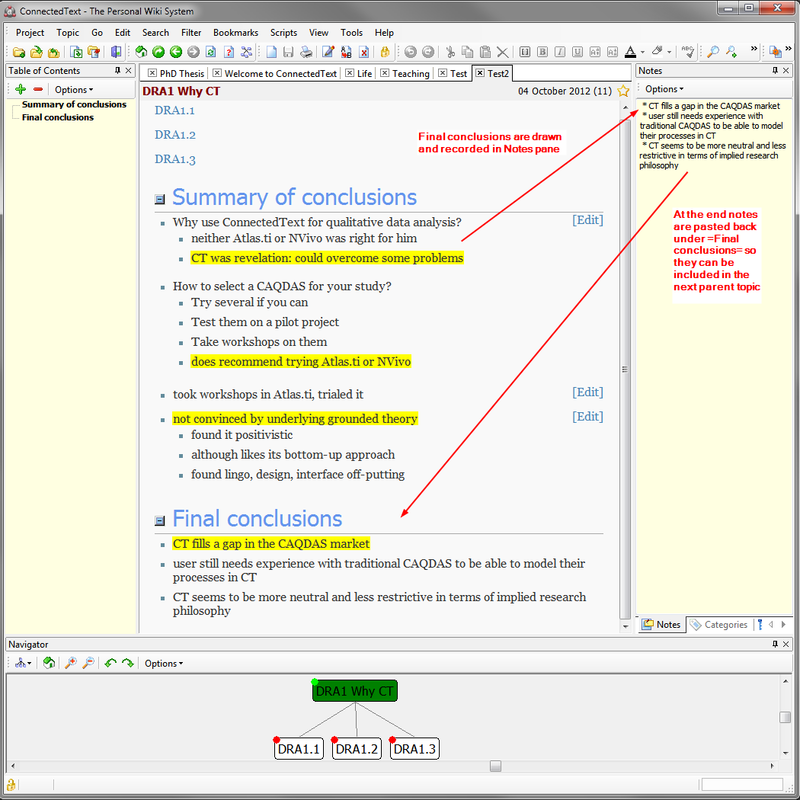 However, when it comes to the very last stages of drawing conclusions and making sense of complex outlines with important information, I like to switch to my favourite outliner, Natara Bonsai (Desktop Edition – see my mini-review of it here). 1) Its ability to choose different colours for different levels of the outline hierarchy. This just makes the analysis so much easier, especially if you end up staring at an outline with a thousand items for several hours. 2) One-click collapsing of levels, so you can choose to see only level 1 items (which at the end of the analysis will be your main findings, as they will have risen to the top of the hierarchy), or also level 2, 3, or 4 items, or have all items expanded. This allows you to toggle on and off layers of different degrees of detail (with each layer or level being a different colour). Finally, its feature to zoom in and out of a branch of an item (also called “hoisting” in other outliners) with one click again makes it very quick to shut out the noise and focus on analysing just a single theme or issue. When I’m done with my analysis and my most important findings have been promoted to the top of the outline hierarchy in Bonsai, I could just export the outline as OPML and import it back into CT as an outline. Although it’s easy enough to do, there is a quicker way. I could just directly copy and paste my new outline into the body of a CT topic. The slight problem with that is that if you select all the top level outline items in a collapsed view, you will still copy and paste the underlying levels of the hierarchy as well, which you may no longer need (as we are after abstraction here).